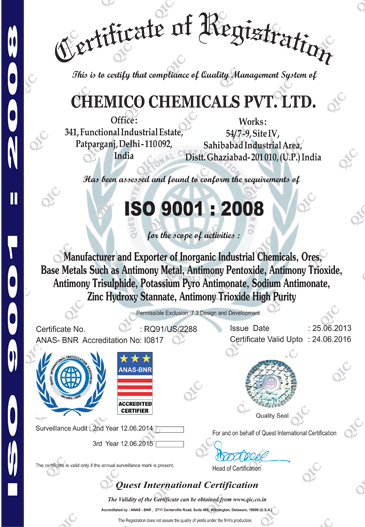 CHEMICO is a trademark of the CCPL The details contained in this documents are current as at 20.02.2003 and are for information purposes only. The statement are not and should not be construed as a statement of fact, representation, guarantee or warranty of any kind and do not constitute a specification. Nothing contained herein is intended as recommendation to use our products so as to infringe any patents. 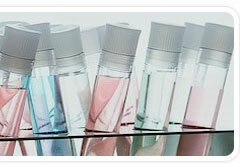 The entire range of chemicals is tested on various parameters to conform quality standards. We also offer free samples to our clients so that they can assure themselves of the quality of the chemicals before finalizing any deal. All our products are packaged in high grade IIP and UN approved packaging material. We also provide customized solutions to suit the diverse requirements of clients within committed time frame. Being a chemical manufacturing organization, we are aware of our responsibilities towards the environment. We understand that the manufacturing process, especially waste material and smoke coming out of the manufacturing unit can cause harm to the environment to great level. Considering these possibilities, we have made proper arrangements to recycle the waste material after the manufacturing process. We have installed latest machinery that neutralizes the effect of the waste material that goes out of the manufacturing unit. Further, we keep upgrading our manufacturing facilities to ensure minimum smoke coming out of our reactors, boilers and other machinery. 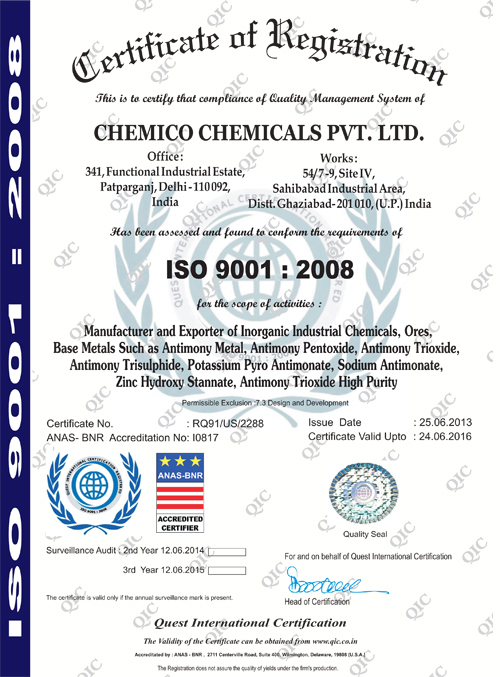 Quality is at the forefront of company's work processes, and has helped us evolve into an ISO 9001:2008 certified organization. We adopt latest technologies and effective innovations to meet the challenges of today's market. Our company does stringent quality checking in all stages of manufacturing that helps us give good value for money to our clients.